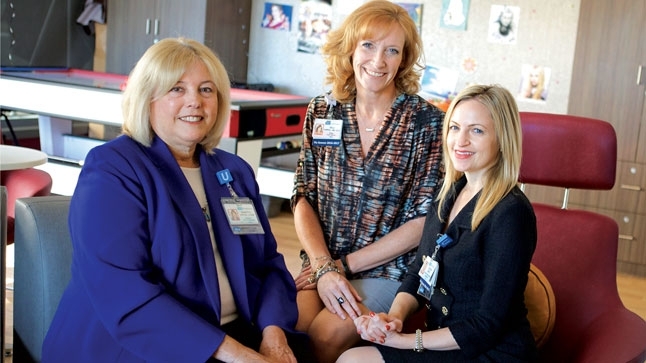 From left to right: Nancy Hayes, Kellye Carroll and Caitlin Beck. No child wants to spend days in the hospital, let alone weeks or months. Yet that’s the reality for many pediatric patients battling chronic or life-threatening conditions at Mattel Children’s Hospital UCLA. The Chase Child Life Program, which helps children and their families adjust to their time at the hospital, recently launched the “Everyday Wish Fund” to help pay for the little things that bring joy to hospitalized children. “We’re focused on making the ordinary possible in an environment that is far from ordinary,” says Caitlin Beck, chief administrative officer at Mattel Children’s Hospital UCLA. “The goal of the Everyday Wish Fund is to do something meaningful that helps our patients and their families focus on something positive.” And in fact, research suggests that uplifting experiences like these can positively impact the health outcomes of children going through challenging medical situations, Beck adds. One teenage patient on hospice had dreams of being an architect, so he requested an architectural building kit for children. Receiving this gift brought immeasurable joy to him and his family members, who were able to see his passion for building come to life. Another child was sad about missing school due to her intensive cancer treatments. “We purchased school decorations and materials and turned her hospital room into a makeshift classroom,” says Kellye Carroll, director of the Chase Child Life Program. One of the boys wore his costume for every medical procedure. “He would spread open his arms and pretend he was flying as he was wheeled down the hallway,” recalls Beck. This holiday season, UCLA Health employees, as well as members of the community, may choose to make tax deductible monetary donations to the Everyday Wish Fund instead of buying and donating toys. “We use the money to make purchases that fulfill individual requests,” says Carroll. “To fulfill larger patient requests, the program also works closely with national organizations like Make-A-Wish®.” The gift is then presented by the Child Life Program or the families themselves. Since its creation, the fund has helped bring smiles to about 20 children. To make a monetary contribution to the Everyday Wish Fund, visit giving.ucla.edu/OperationU.